SEOs are used to Google truncated their titles in the search results, most often because the title is too long for the search results. But now it seems Google is also truncating Google AdWords too. 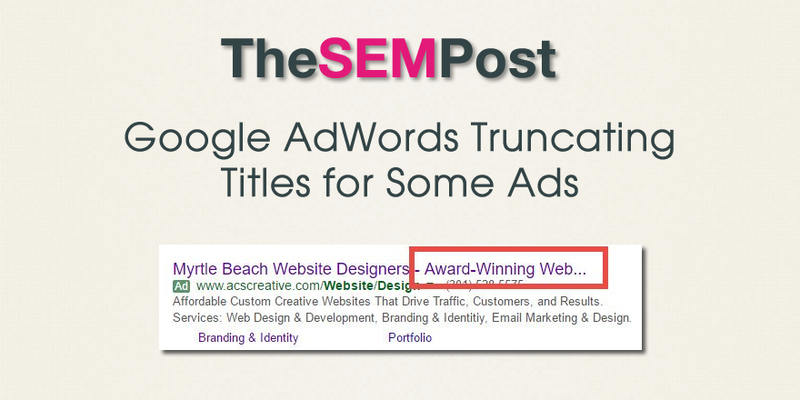 Mark Kennedy spotted the AdWords truncation and posted a screenshot of it. Because titles are actually pixel length and not a true character count, this particular example has many wider characters in this title – Ms and Ws. I tried a few searches but didn’t see it in action myself but others are reporting it. If you have any ads that are making maximum use of the character count – and especially if you have noticed any changes in CTR over the past few days, it might be worth doing an audit to see if any of your AdWords ads are getting the titles truncated as well. Added: Google has responded with tips to avoid truncation, which is to limit your ad character count to 33 characters across headlines 1 & 2, and using the ad preview tool will identify truncation issues. So what is the point of having these new “Extended Text Ads” if they are just going to be truncated?